Just a quick note for anyone who may want to join us in AZ for our annual pinball and arcade convention, Zapcon! Main Tournament - limited qualifying on 6 machines (15 entries for $40) - qualifying available 10:00am - 11:30pm on Saturday. Top 16 to A finals, next 8 to B finals on Sunday at 10:30am and 9:00am respectively. Classics Tournament - limited qualifying on 4 machines (12 entries for $30) - qualifying available 10:00am - 11:30pm on Saturday. Top 12 make finals Sunday at 9:00am. Women’s Tournament - group matchplay - 2 sessions of qualifying at 10:30am and 4:00pm of 4 rounds each, up to 32 players each. Top 4 advance from each round to finals at 7:30pm. $10 per qualifying session. Trophies to top 4, cash prizes to top 8. Sponsored by Tilt Studio Arizona Mills, hosted by Belles & Chimes Phoenix. 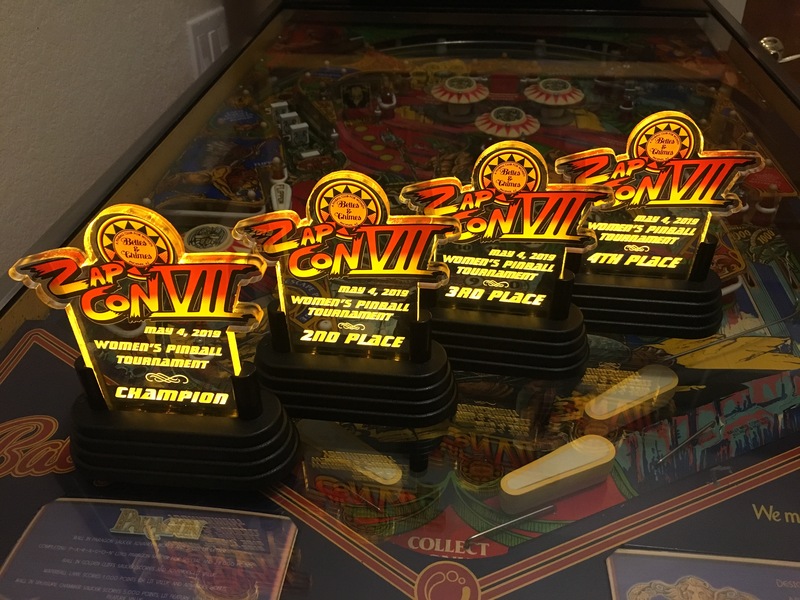 Looks like there will also be a return of the non-IFPA pingolf course, a Kids pinball tournament and high score tournament sponsored by StarFighters Arcade, and tournaments on: NBA Jam, Cyberball, Tetris, Street Fighter, Marvel vs. Capcom… whew, a busy, awesome weekend! And the trophies for the women’s tournament have arrived!